This 20-pound mantis tiller rental makes close tilling in beds and gardens a breeze. It's a little package but very handy for close work, and a surprisingly big-time performer with a maximum tilling depth of 10 inches in established beds or gardens. Because this Mantis tiller rental only weighs 20 pounds, it's a dream for established gardens and smaller garden projects. 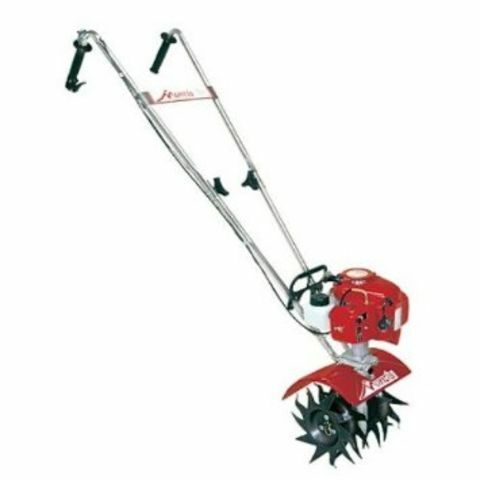 The Mantis has a tilling width of 9 inches and tilling depth of 10 inches, which is exceptional considering its light weight. 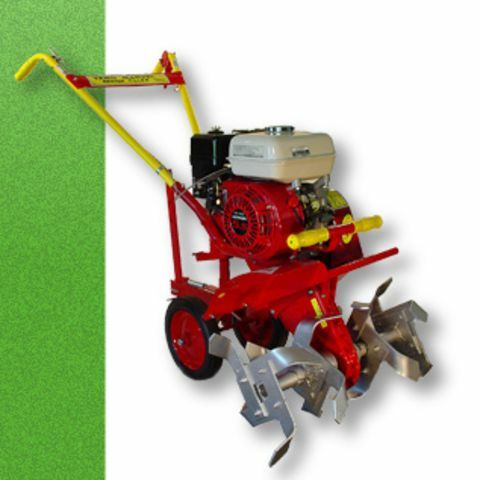 Or for shallow cultivation or weeding, you can reverse the tines on the Mantis and just till the top two or three inches of soil. Speaking of weeding and turning the top layer of soil, there's a lot of virtue in hard work, but save your back and time by renting a Mantis tiler to turn the soil. 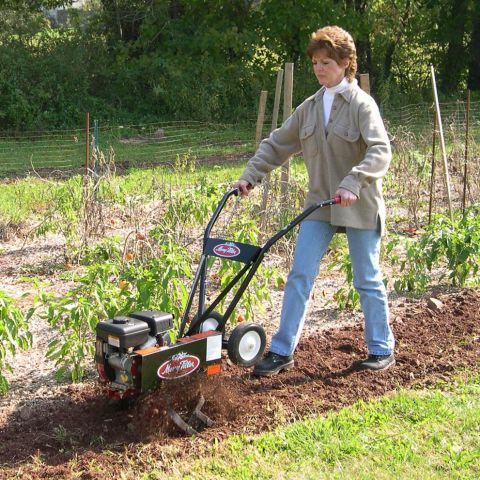 If you're looking taking a shot at preparing the soil for a new garden plot -- and turning in compost, mulch or amendments, you'll want to look at a larger, heavier tiller. 25cc 4-cycle Honda® gas engine. 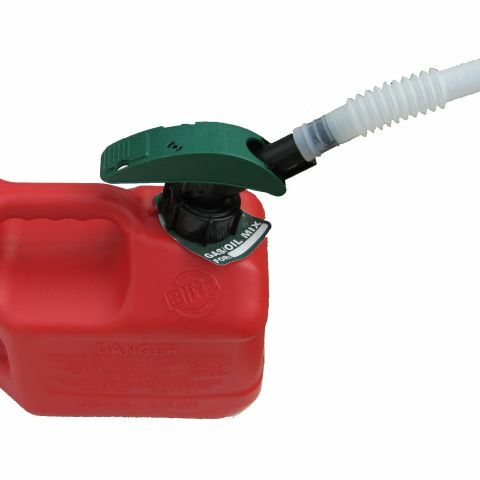 Does require any mixing of gas and oil. Absolutely! At only 20 pounds, the Mantis Tiller rental is light enough for most anyone to use and transport! Plus the adjustable handles fold down to make this rental tiller fit in just about any sized car. Should I use this on my lawn project -- Will this bust up the old sod I'm taking out? No,for big lawn jobs or busting up established sod, you're better off using a larger tiller with more horsepower. How do I get the tiller to my garden? You can carry it: Make sure the engine is off. Then use one hand to grasp the convenient carrying handle. Use the other hand to hold the handlebars. Then lift your tiller and carry it to your garden. If you have several areas you may "walk it:" with the tiller running, press the throttle lever gently and let the tiller "tip-toe" across your yard on its tines. It won?t hurt your lawn or driveway. How do I use the tiller? Run the tiller like a Vacuum Cleaner. Place your Tiller at the head of the row or area you want to till. Start it up. Then use an easy rocking motion. First, pull the tiller backward. Then use an easy rocking motion. Again, pull the Tiller backward. Then, let it move forward just a little bit. Then pull it backward again. This will help you till deeper. Keep repeating these steps until you've tilled an entire row. Start again on the next row. How do I control the depth? 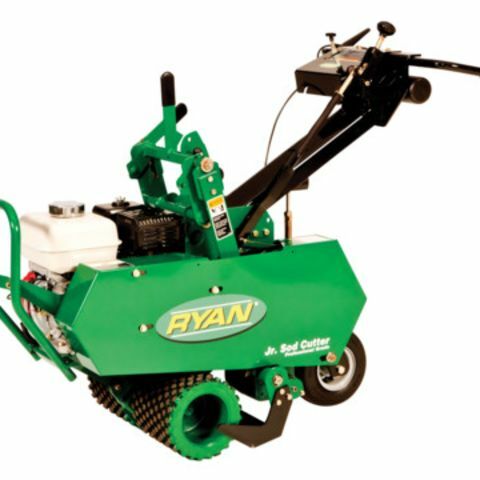 For Deeper Tilling: Move your Tiller slowly back and forth, as you would a vacuum cleaner. Work the same area over and over until you've dug to your desired depth. For Shallow Tilling: Switch the tines to the cultivating position. Then move your Tiller quickly over your soil surface. How do I set the tiller to cultivation mode? 1. Make sure the Tiller is off. 2. Remove the retaining pins from the tines. 3. Remove the tines from the axle. 4. Place the right-side tine onto the left-side axle. Place the left side tine onto the right-side axle. The "D" hole should be to the outside. 5. Here is how to make sure you've installed the tines properly. Stand behind the Tiller and hold your hand, palm up, next to the tines. Do the tine points curl up, as your fingers do? If so, they are in the correct cultivating position. 6. Reinsert the pins. How to I approach big weeds or tough roots? Let the tiller rock back and forth over the tough spot, until the tines slice through the weed or root. It's always a good idea to soften the soil you'll be tilling by watering it down a day or two before you begin. Not so much that you turn it into a mudbath, but enough to loosen the soil -- it's easier on the machine and will be easier on you, too. Read the manual -- this rental tiller is designed to be a safe-operating machine, but before you till your garden, make a point of getting as smart as you can about safe operations. DO: Keep both hands on the rental tiller whenever the engine is running, and make sure the digging tines have stopped completely before letting go.